President Donald Trump spoke at a women's empowerment panel at the White House on Wednesday evening, and started naming a number of women that he believes have changed the country. They included Abigail Adams, Harriet Tubman, and Susan B. Anthony. But his speech got Twitter talking after he asked the group of women if they'd ever heard of Susan B. Anthony. Although the question appeared to have been asked in a joking manner, and was followed by the comment: "I'm shocked that you've heard of here," it still sparked fierce criticism online. Even Chelsea Clinton got involved in it. 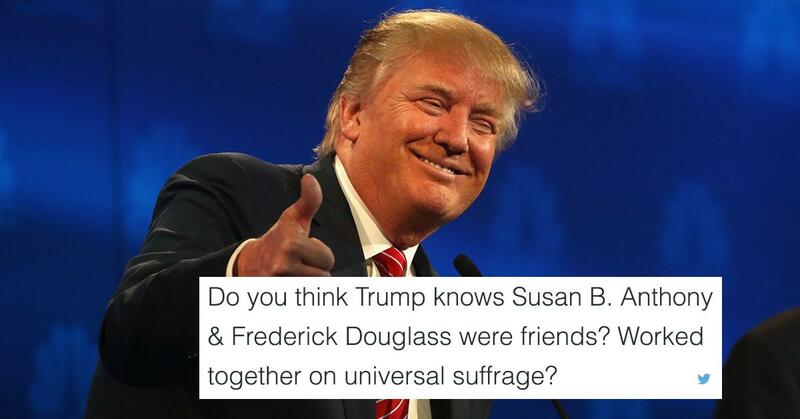 "Have you heard of Susan B. Anthony?" the president asked a group of women today at the White House. "Mr. President, tell us what you most admire about Susan B. Anthony?" If there's one thing Donald Trump has learned today, it's that presidents probably shouldn't be sarcastic.